Scientists in the UK and Malaysia have discovered the world’s tallest tropical tree, and possibly the tallest flowering plant, measuring over 100 metres high. Laid down, it would extend beyond both goals on a soccer field. The team found the tree in the rainforests of Sabah, Malaysian Borneo, and have undertaken a novel three-dimensional exploration of the remarkable find to better understand how trees grow so tall, and what keeps them from growing taller. The tree is a Shorea faguetiana (common name Yellow Meranti), of the Dipterocarpacae family that dominates the humid lowland rainforests of South East Asia. Previous record breakers have largely come from the same genus (Shorea) and region. The team has given the tree the name of ‘Menara’, which is Malay for ‘tower’. The tree was first spotted by researchers from the University of Nottingham led by Dr Doreen Boyd in 2018, using an airborne Light Detection and Ranging Survey (LiDAR) where lasers pulses are reflected off the canopy and ground surface. 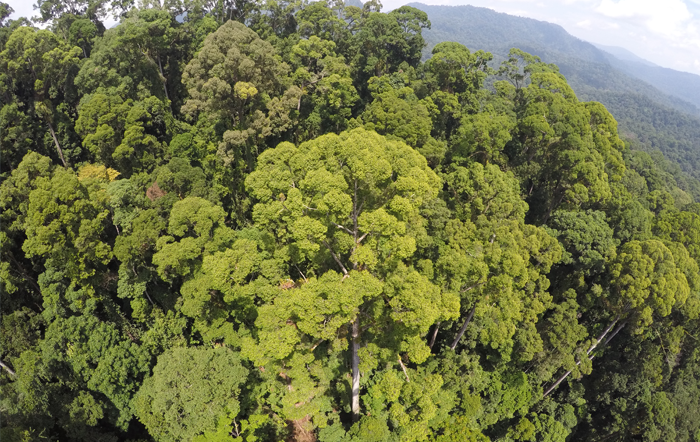 Researchers from the University of Oxford and SEARRP partners then trekked out to Menara in August 2018 to conduct high-resolution 3D scans and drone flights, which have produced remarkable 3D visualisations of this amazing tree . 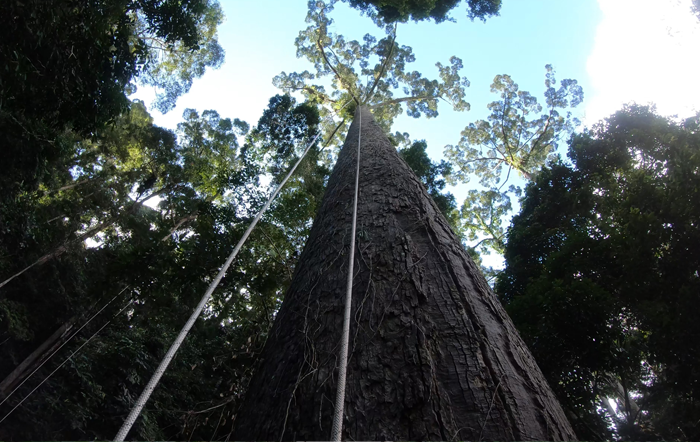 A local climber, Unding Jami, climbed the tree in January 2019 to measure its height with a tape measure; it came in at 100.8 meters, making it also a probably the tallest flowering plant on Earth (beating the previous record holder: a eucalyptus tree in Tasmania). Excluding roots, Menara weighs 81,500 kg, or more than the maximum takeoff weight of a Boeing 737-800. Only 5% of its mass is held in its 40m-wide crown, whereas 95% is in its trunk. The stem is very straight, with the centre of mass at 28m above the ground and only displaced by 0.6m from the central vertical axis, suggesting the tree is highly symmetrical and well-balanced despite being situated on sloping ground in a sheltered valley. So, is this tree near its limits in terms of how high a flowering plant can grow? The scientists’ analysis of the tree’s structure suggests that that Menara is a long way from buckling under its own weight, but may be vulnerable to wind breakage. Its location in a sheltered valley protects it somewhat and probably aids it to grow to such extreme heights. Are there likely to be still taller trees out there? A full copy of the paper detailing the find is in review at a scientific journal. You can watch animations of these 3D models on the ECI YouTube channel.